Heavy-duty, steel workstation protects and secures your computer equipment in industrial environments. The hard-wearing design is perfect for schools, colleges, universities, libraries etc. Lockable slide out keyboard tray & cupboard. 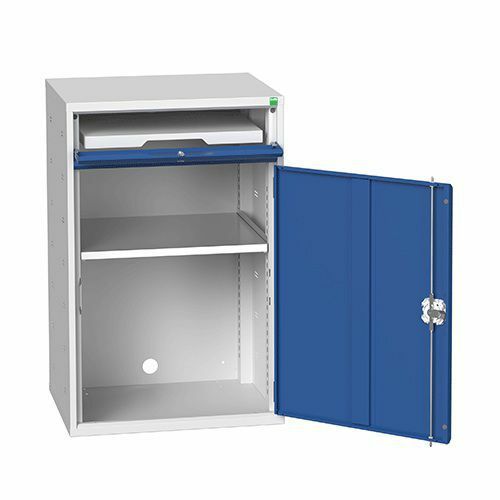 Ventilated, lockable monitor housings & cupboard, for extra security and protection. Inner shelving has a tough 60kg UDL, suitable for industrial environments, and is adjustable on 25mm increments. Cupboard features in-built cable routing apertures. Heavy duty industrial computer workstation offers a strong UDL of up to 600kg.